Why choose FOG Bandit ? Fog Bandit system has been embraced by the Jewellers trade and other high value stock enterprises for day time raid protection. The critical issues for jewellery stores and other high-value stock sites are ensuring that intruders leave without taking or damaging stock, and ensuring staff are safe and secure if a raid occurs during opening hours. This is accomplished by taking away the Intruders ability to see the stock in a matter of seconds. 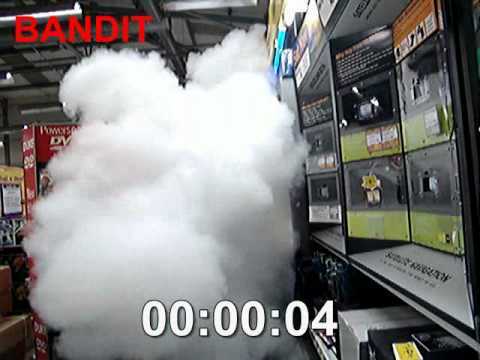 Fog Bandit can be used in a multitude of different environments to protect high value goods and sensitive areas. From Retail Electrical Shops to Company IT Rooms, Computer Suites and many other applications. On activation a Fog Bandit unit will fill the protected area with a vapour cloud until visibility is reduced to virtually zero.